PORT-AU-PRINCE, Jan. 25, 2007 (AFP) - Twenty-four hours of clashes between UN forces and armed gangs in the Haitian capital's sprawling slum of Cite Soleil have left at least five people dead and 12 wounded by gunfire, the UN mission in Haiti said. "Four people, all likely gang members, were killed in clashes Wednesday at dawn between the blue helmets and gunmen," said a spokesman for the UN Stabilization Mission in Haiti (MINUSTAH). Six people were wounded during a MINUSTAH operation "to take over a house near an important road controlled by the gangs that also served as a base for attacks against UN forces," the spokesman said. The gangs were extorting money from truck drivers and motorists on the busy road, he added. A woman wounded at Cite Soleil died a few hours later, late Wednesday, at Saint Catherine Hospital, run by the humanitarian group Medecins Sans Frontieres (MSF) inside the shantytown. "We received seven wounded on Wednesday evening. Among them were three women, one of whom died several hours after having been admitted to hospital," Fabio Pompetti of the MSF team working at the local hospital told AFP. "We're preparing more interventions in high-risk areas of Port-au-Prince," the MINUSTAH spokesman said. 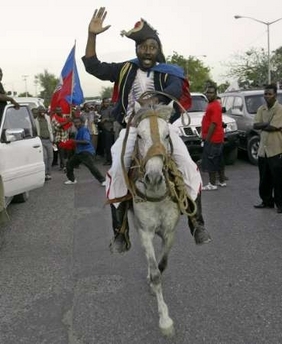 Over two decades, Haiti has suffered from political violence and instability, notably since the departure of then-president Jean Bertrand Aristide in February 2004 amid a popular uprising. After Aristide's exit into exile, a force of over 7,200 UN soldiers and 2,000 police went to the impoverished Caribbean country to maintain order while an interim regime sought to restore stability. More than half of the Caribbean island's 8.4 million people live below the extreme poverty line of one dollar a day, according to UN officials. Five Montreal men have been found guilty of gangsterism, in what is believed to be the first time a street gang has been recognized as a criminal organization under the law. The gang's leader, Bernard Mathieu, has also been convicted of conspiracy and drug trafficking. The verdict, which came some four months after the proceedings began, was handed down Wednesday by Quebec court Judge Jean-Pierre Bonin. Fourteen of the 15 men originally facing charges were also found guilty of drug trafficking. One man was acquitted. In his ruling, Bonin said the gang's activities fit the definition of organized crime. The convictions are believed to mark the first in Canada that a street gang has been recognized as a criminal organization. A total of 15 men were facing 58 counts of charges ranging from gangsterism to drug trafficking. "The Crown alleged that these people were essentially controlling the drug market on Pelletier Street in Montreal North, thus their name, the Pelletier Street gang," CTV Montreal's Stephane Giroux reported. "The defence is not too happy with this, saying that they don't qualify as a street gang and they plan to appeal." Some of the guilty face deportation while others face a maximum of 14 years in prison. "It may not be the end of their troubles, because a lot of these people -- although they've lived in Canada for most of their lives -- they're natives of Haiti and they don't necessarily have Canadian citizenship," Giroux said. PORT-Au-PRINCE, HAITI - A Haitian photojournalist was shot to death at his home in a violent slum days after he photographed gang members, a UN official said Wednesday. Jean-Remy Badio, a freelancer, was slain last Friday in the southern Port-au-Prince slum of Martissant, said Fred Blaise, a UN police spokesperson. Blaise said gang members were suspected in the shooting but no arrests have been made. International press freedom group Reporters Without Borders said Badio apparently was killed by gang members he had photographed days earlier. It said Badio's family had reported receiving threats before his killing. "Badio's tragic death is a harsh blow for the Haitian media, for whom conditions seemed to have improved during the past year," the Paris-based group said in a statement. In November, another Haitian photographer was assaulted by a UN police officer while covering a demonstration in Martissant. The UN mission apologised for the incident and reprimanded the officer. Rival street gangs have been battling for months in Martissant, among the Caribbean nation's most violent neighbourhoods. Gang members rarely allow themselves to be photographed out of fear of being identified by police. It wasn't immediately unclear if Badio, 45, had permission to take the photographs, which haven't been published. Prime Minister Jacques Edouard Alexis said Tuesday the government had authorised UN peacekeepers to increase patrols in Martissant to clear out the gangs, which flourished after a February 2004 revolt toppled former president Jean-Bertrand Aristide.